Building in a PHP environment? Get started with ChartMogul more easily than ever. Use our new PHP client library to interact with the Import, Enrichment and Metrics APIs in the ChartMogul platform. Import API allows you to push your billing data to ChartMogul from anywhere, and start analyzing your subscription revenue. Enrichment API lets you push additional customer metadata to ChartMogul, for use with Segmentation. Metrics API gives you access to your SaaS metrics and analytics data – to put ChartMogul’s insights wherever it’s most valuable for your team. These APIs are for you to use — to build with and build from — to create unique value for your business. Since they form the basis of all integrations with ChartMogul, we both consume and maintain each API on our end. In our commitment to making ChartMogul the most powerful platform for subscription businesses, we regularly build and release new tools and plugins for our customers. For example, you can import spreadsheet data directly (and swiftly) to ChartMogul via our Google Sheets app. We also recently launched Ruby and Node.js client libraries, for those of you building in those environments. Now, we’re excited to announce our PHP client library! You don’t need to worry about handling raw API requests and responses. You can interact with ChartMogul using naming conventions that are on the same level as ChartMogul, i.e. Invoices, Plans, etc. You can get up and running much more quickly, and save developer time. The library will be maintained and updated to reflect new functionality as it’s launched. The PHP client library is fully open source. We encourage the developer community to suggest improvements or raise issues, so that we can maintain the best possible implementation for you. Check out the project on GitHub if you want to have a look around. Full documentation and code examples for usage will be available on our Developer Hub very soon, but until then you can find everything you need, including a full list of supported methods, parameters, and errors in the project’s README. Can you make a client library for [X]? 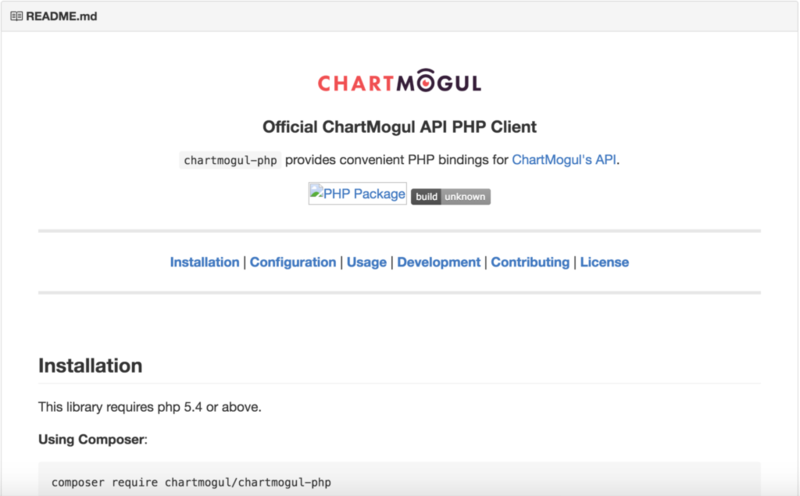 The PHP client is our third client library for the ChartMogul platform. We have plans for more languages and frameworks in the pipeline. If there’s something specific that would make your life easier when interacting with ChartMogul, let us know via email so we can prioritize accordingly!